I had the chance to see a preview of The BFG last night. My nine-year old son loved it and you'll get a review of the movie come release day. One of the features of the book/movie is the language of the BFG. He speaks kind of funny in a language dubbed Gobblefunk. 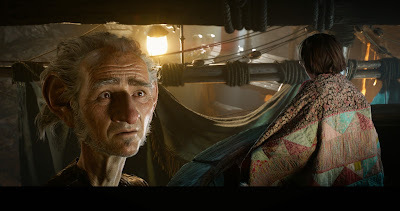 The BFG (Mark Rylance), while a giant himself, is a Big Friendly Giant and nothing like the other inhabitants of Giant Country. Standing 24-feet tall with enormous ears and a keen sense of hearing, he is endearingly dim-witted and keeps to himself for the most part. Giants like Bloodbottler (Bill Hader) and Fleshlumpeater (Jemaine Clement) on the other hand, are twice as big and at least twice as scary and have been known to eat humans, while the BFG prefers Snozzcumber and Frobscottle. Upon her arrival in Giant Country, Sophie, a precocious 10-year-old girl from London, is initially frightened of the mysterious giant who has brought her to his cave, but soon comes to realize that the BFG is actually quite gentle and charming, and, having never met a giant before, has many questions. The BFG brings Sophie to Dream Country where he collects dreams and sends them to children, teaching her all about the magic and mystery of dreams. 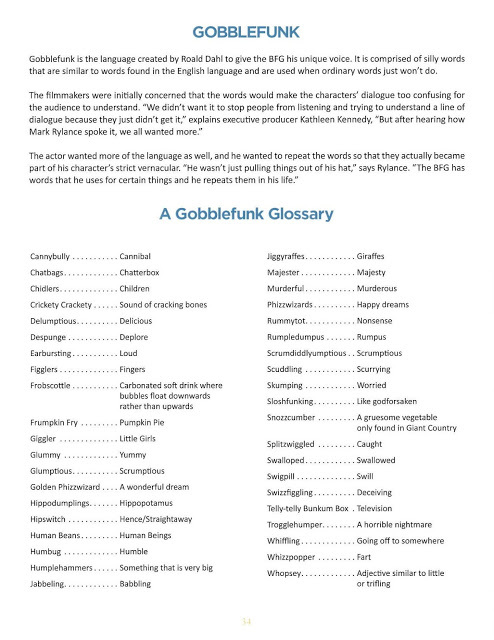 Now, about that Gobblefunk... here's a glossary for you to review before seeing the movie. You don't need to see this before the story, but if you already know the language, you might "get" things a little more quickly during the movie.